James Wallace Ireland Enlisted in D Coy, 34th Battalion, Australian Imperial Force on 16 Jan 1916 at West Mailtand, New South Wales, Australia. He served until discharged on 12 Aug 1919. Henry William Griffiths enlisted in the Australian Imperial Force on 14 June 1918 but was discharged medically unfit during his recuit training phase due to him being missing three fingers on his right hand. Private Mar Griffiths 7206 Embarked HMAT A48 Seang Bee, 10th February 1917 at Adelaide for England. Sapper Albert Alexander Kirkwood N248299, enlisted into the Royal Australian Engineering Corps on 2 February 1942 and served until discharged on 19 February 1944. World War Two Military Service Certificate - Private Stanley Cluff N196660. Stanley Cluff enlisted in the Australian Army 10 March 1942 at Dunedoo, New South Wales, Australia and Served until discharged on 21st February 1946. Private Stanley Cluff N19666 enlisted in the Australian Army 10 March 1942 at Dunedoo, New South Wales Australia and Served until his discharge 21 February 1946. Lance Corporal Stanley Dudley Potts N161346 enlisted in the Australian Army on 27 Jan 1942 at Wauchope New South Wales. He served in 19 Works Company until his discharge on 14 Feb 1946. 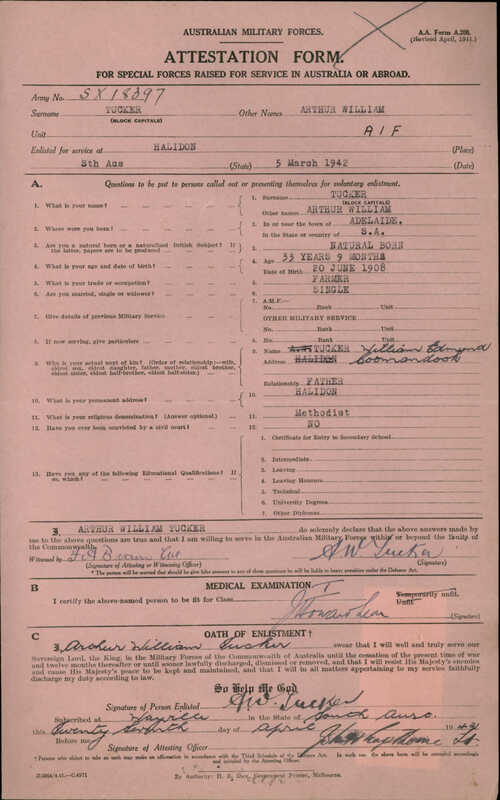 Sapper Albert Alexander Kirkwood N248299, enlisted in the Royal Australian Engineering Corps on 2 February 1942 at Enmore, New South Wales, Australia and served until discharged on 19 Feb 1944. George William Griffiths N372041 enlisted in the Australian Army on 05 Jun 1941 and served until discharge on 30 September 1945. Woronora Memorial Park, Burial Register Transcription, Evelyn May Lang. WW2 Certificate of Miltary Service. Yorkshire Baptisms, Knaresborough Parish, Yorkshire, England - Robert Potts. Robert Potts was baptised at St John's Chapel Harrogate, North Yorkshire, England, 26th November 1797. St John's Chapel was part of the Knaresborough Anglican Parish. Zenna is the wife of Clarence Griffiths.